The below chart shows the relative purchase rate by carrier (normalized by carrier size) of the largest wireless carriers in the United States, Canada, and the United Kingdom. 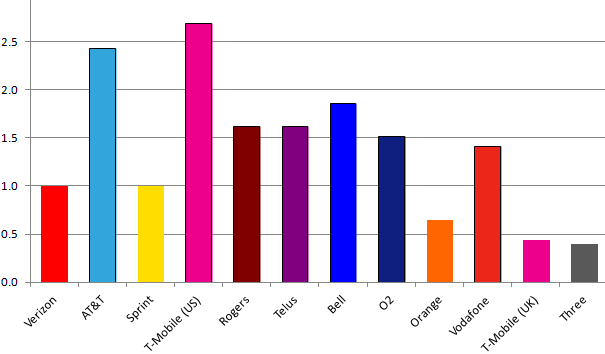 The carriers with a bold outline on the chart (AT&T, T-Mobile (US), Rogers, Telus, Bell, O2, and Vodafone) all support carrier billing. As seen before, users are far more likely to make purchases if carrier billing is supported. On average, purchases are 2.7 times more likely if carrier billing is supported then if it is not. The measurements in this chart are relative to the number of purchases at Verizon Wireless (our selected baseline), such that Verizon would always have a value of 1.00. The number of purchases is based upon purchases of Pixelated Plus from July-September 2012. Normalization for carrier size was based on data from the free application Pixelated over the same time period. All data was collected through BlackBerry AppWorld at the time of download.